Do you know about Sickle Cell Disease?Ever wondered what a person living with Sickle Cell Disease thinks about the condition? Have you spent some time with a child living with Sickle Cell Disease? Did they have any information about the condition? Several years ago, I spent some time at the paediatric Sickle Cell Clinic. It was a very interesting place with a lot of knowledge to acquire. At that clinic, we attended to a child with the rare haemoglobin genotype, CC which technically is not Sickle Cell Disease although a haemoglobinopathy in its own right. I also saw a child who had bi-parietal, frontal and occipital bossing in addition to severe gnathopathy. Information I had only read but never seen especially not this severe in one person. Stigmata (signs) of Sickle Cell Disease. I was curious, do children living with Sickle Cell Disease understand their condition? Exactly how much insight did this child have about the illness? So with permission from his mom, we got chatty. He was 11, 3 years behind in his education because of frequent ill health, hospitalization and absence from school. He wanted to be a pilot (just don’t think about high altitudes and oxygen saturation now. Let’s allow the kid to dream). Then there was an essay. A very simple one, about Sickle Cell Disease. Published with consent. Photo Credit: Sickle Life. When I come to reviews they tell me that I should buy Zincovite and Folic Acid. When I come to hospital they tell me not to eat oily food. This is what I know about sickle cell disease. In some parts of Ghana, sickle cell disease/persons living with sickle cell disease are called “yellow eyes”, due to the fact that jaundice is a prominent feature of sickle cell disease as a result of the constant breakdown of abnormal cells. It is important to note that, “yellow eyes” is sometimes used as a derogatory expression to tease children living with sickle cell disease. As you may be aware, people living with sickle cell disease are expected to be on routine medication. Commonly Folic Acid, which is required in the production of new cells and is generally needed in higher quantities in people with sickle cell disease due to the high cell turnover. Zinc, in formulations such as Zincovite is essential for stabilizing the red cell membrane and of course Vitamin C.
In addition to these are important immunizations and other routine medication prescribed by health care providers to ensure a healthy or rather relatively healthy life for people living with sickle cell disease. Admittedly, I have not been advised to limit fat intake intake specifically because of sickle cell disease nor have I heard anyone else give this advice routinely. However, with the increased risk of gallstones formation, I guess dietary fat limitation is in order. However we need to remember that the main reason for the gallstones is actually the increased breakdown of abnormal red blood cells. Also a balanced diet is certainly useful in maintaining good health. Dehydration is a common cause of crises in sickle cell disease. It is thus important to prevent dehydration at all cost. People living with sickle cell disease are advised to drink large volumes of water daily to maintain good health. In situation where the risk of dehydration is high, such as if a person is vomiting or has diarrhea, Oral Rehydration Salts come in handy and when oral fluid intake is not possible, intravenous fluids, to prevent crises. Note that fluid therapy is a key component of management of sickle cell disease. Vaso-occlusive crises could occur in any part of the body and could be triggered by just about anything. Heat, cold, stress, dehydration, infection etc. Long bone pain, acute chest syndrome and priapism are common, however, abdominal pain due to mesenteric infarction is also possible. Anaemia is another key feature of sickle cell disease. Symptoms include palpitations, as described by this child as well as easy fatiguabilty, breathlessness on exertion, headaches, dizziness and poor concentration. These are common complaints of most people living with sickle cell disease. Febrile illness are common in sickle cell disease, mostly due to the lowered immunity. Infections in turn easily precipitate crises and lead to long periods of hospitalization. In the tropics, malaria is more common and severe in people living with sickle cell disease, thus extra effort is required in its prevention such as the use of insecticide treated bed nets. 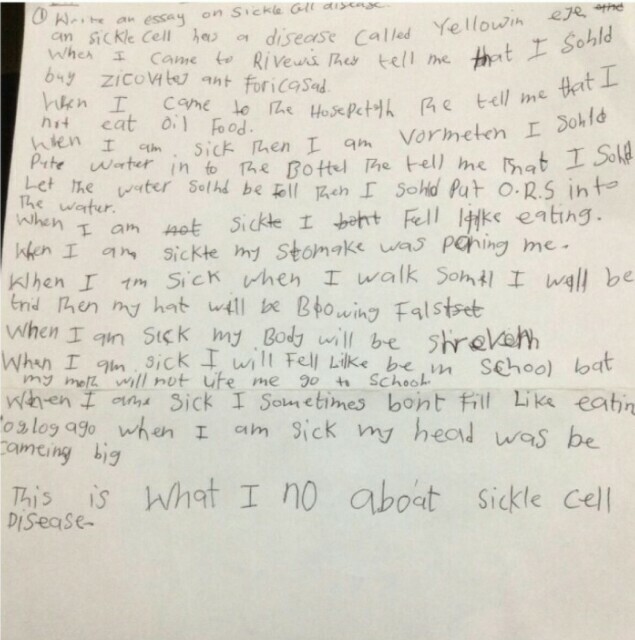 This must have been a complaint of every child living with sickle cell disease at some point in their lives. As I mentioned earlier, he is 3 years behind his colleagues due to constant ill health and hospitalizations. This of course is one of the social complications of living with chronic medical conditions such as sickle cell. I can certainly identify with this. Pain has an uncanny way of robbing you of the desire to eat or do anything else for that matter. When you don’t feel like eating when you are sick, and happen to be sick more days than not, this can only have a negative impact on your health and well being. This was in reference to bossing that had occurred during infancy, which his mom probably told him about. Frontal bossing as well as gnathopathy are some of the facial featuers observed in people living with sickle cell disease and for which a lot of children are teased. This is what one child living with sickle cell disease knows about it. It would be interesting to learn what your child living with this condition also thinks about it. We’ll like to hear from you. Submit their essays to sicklelifemd@gmail.com. Please spend some time finding out what people living with sickle cell disease think/ know about the condition. It just might help you in coming to an informed decision about having a child with sickle cell disease. Again, what do you know about sickle cell disease? 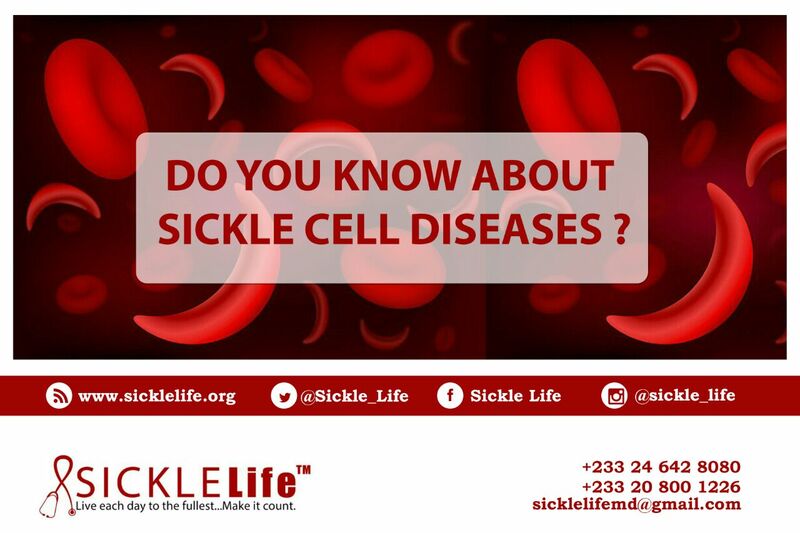 What does your partner know about sickle cell disease? What do your friends, neighbors, family know about sickle cell disease? This might be your chance to educate someone, please spread the word, share this post, tell someone about sickle cell disease. Sickle Life is grateful to this family for granting as consent to use their story. Contact Sickle Life for more information. *In commemoration of World Sickle Cell Day (June 19th) join the Sickle Life team at the Southern Area Blood Bank, Korle-bu on Saturday June 18th from 9am-3pm for a subsidised Sickle Cell testing (sickling test + Hb electophoresis) and voluntary blood donation exercise. There will be a lot of games, food and drinks and opportunities to interact with people living healthy successful lives with Sickle Cell Disease. This entry was posted in Blog and tagged Ghana, sickle cell awareness, sickle cell disease, Sickle Life, Voluntary Blood Donation, World Sickle Cell Day. Bookmark the permalink.